Amina Sahan is an artist with Iraqi and Norwegian background, based in Oslo, Norway. She is educated as an art teacher (Bachelorś Program Specialized Teacher Training in Design, Arts and Crafts, Masterś Program in Visual and Performing Arts: Art and Design Education at Oslo and Akershus University College) and has worked both as a teacher and an artist in the last 4 years. Sahan is inspired by ongoing debates concerning multiculturalism, diversity and freedom of speech. Working primarily with painting, but also drawing and mixed media, her work concentrates on contrasts in both the content it depicts and its materiality. In 2016 she wrote her Master thesis in Arts and Design Education on the relationship multicultural youth in Oslo have with visual art. 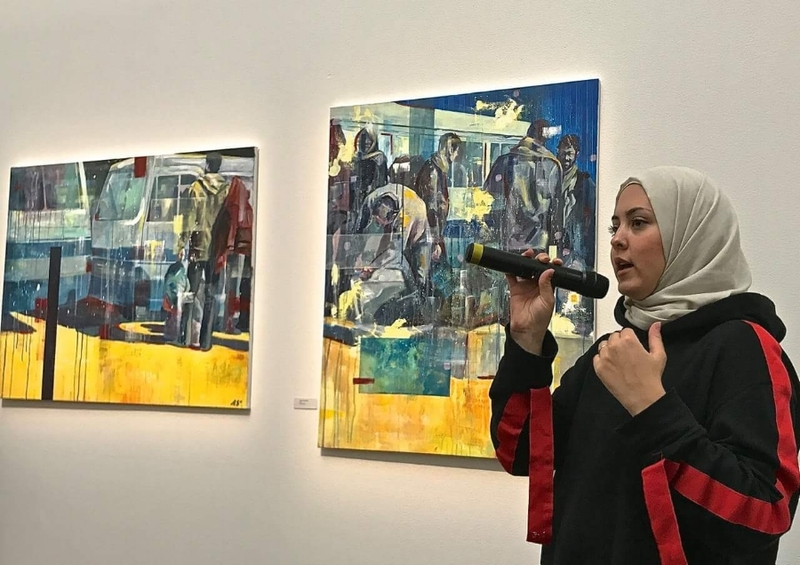 She has developed this topic throughout her artistic career and as an activist, using exhibitions, lectures and the media. Her intention is to make art available in public space, and relatable to the multicultural youth of Oslo. Sahan has exhibited in various arenas in Norway, Sweden and New York. Both in galleries and urban spaces.